All coffee lovers strive to get the best possible cup of their sweet, sweet caffeinated nectar from home. One of the best ways to achieve a great brew is by having freshly ground beans. But what if you don’t want to buy both a machine AND a grinder? Or just don’t feel like going through the trouble of grinding the beans yourself? Fear not, the coffee consumer market has got you covered with bean to cup coffee and espresso machines. Plus, Roasty has gone ahead and reviewed some of the top options for you. We’ve even thrown in some tips on how to distinguish the gems from the coal in case you venture out on your own. Why does a fresh grind matter in the first place? 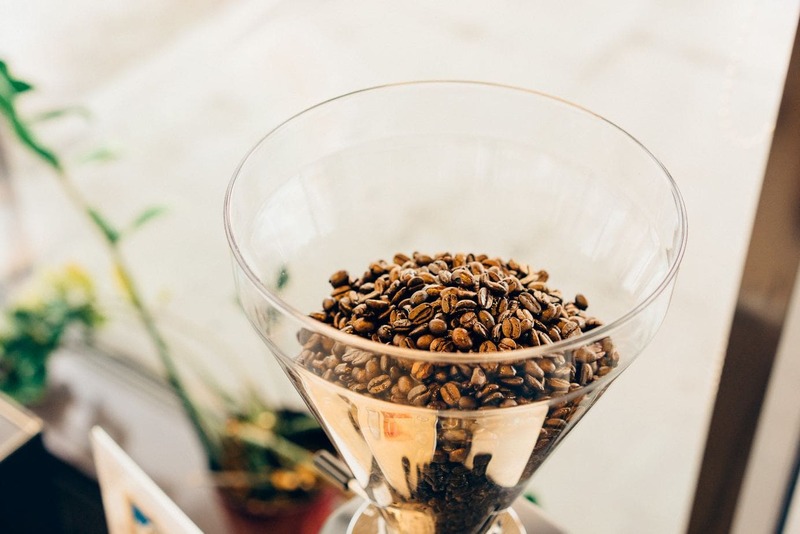 Even if you’re opting for a separate grinder, having freshly ground beans is important to the brewing process. Once ground, beans quickly lose their flavor, resulting in bland brews. Plus, investing in a machine with a top-notch grinder means the oils that make each blend unique get released evenly. That means in turn, you’ll get a great tasting cup. This option is perfect for those with more modest budgets. But with impressive programmability, you won’t be sacrificing on quality. Cuisinart is relatively new to the coffee game; however, their machines are some of the leading models in the grind & brew arena. The DGB 900BC is our top pick from the lineup for a few reasons. 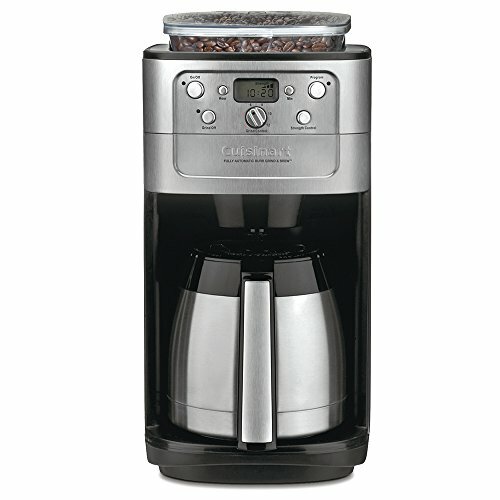 This model’s top selling points are the surprisingly quiet stainless steel burr grinder and impressive programmability. 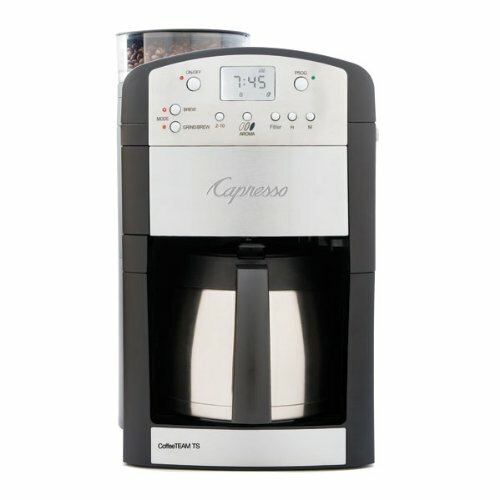 It has 3 brew strength options (strong medium and mild) and volume control from 2-12 cups (increments of 2). Additionally, this is a 24-hour programmable machine, meaning you can wake up to an ultra-fresh pot of coffee every morning. The double-walled thermal carafe keeps the coffee hot for a few hours without a hitch. This is especially important because this machine does not have a hot plate to force the warmth upon your brew. There are only two real drawbacks for this machine. First, the chute is a bit cumbersome to clean, requiring a fine brush that must be purchased separately. Second, the grind size cannot be altered. However, the grind preset is a pretty standard mid-size that is big enough to prevent clogging and fine enough or good flavor extraction. So, overall this machine is a pretty great option. With a steeper but still reasonable price, this Breville machine has just about everything you could hope for. Conforming to Breville’s reputation for high brewing standards, the BDC650BSS is truly a marvelous machine. It’s biggest asset is the level of customizability. With 8 strength settings and 6 fineness settings, there’s plenty of room for experimentation to get your perfect cup of Joe. We recommend starting with level 3 on the grind size and working from there. However, if you have a pre-ground specialty coffee, you can even turn on the Pre-Ground mode to temporarily bypass the built-in stainless steel burr grinder. The drawbacks on this machine are pretty minor. If you use a lot of specialty coffee, you’ll need to clean this machine to keep from shortening the lifespan (due to the extra oils). Also, it is a little slower than some of its competitors, but the 24 hour programmability helps mitigate that issue. Our favorite aspect of this machine is its longevity and durability. Technically similar to the Cuisinart, this machine has solid built quality that means it’ll stick around in your kitchen for years to come. The Capresso has a stainless steel conical burr grinder, 10 cup brewing capacity(4, 6, 8, and 10 cup options), and 3 brew strength options (strong, regular, and strong). All of that is about standard, so what sets it apart from the Cuisinart model is the grind settings. The 465 has 5 grind settings, which allows you to account for the oil discrepancies between light and dark roasts. This helps improve the lifespan of the machine and cuts down on required maintenance. The complaint we have for this machine varies in severity depending on your lifestyle. The main one is that this grinder, while it’s high-quality, is quite loud. For someone living alone or with heavy sleepers, that’s no big deal, but for early risers in sleepy households, it might be. I you need something with a glass carafe, smaller footprint, or lower price, you can opt for the Capresso 464.05 If you click this link and make a purchase, we earn a commission at no additional cost to you. instead. 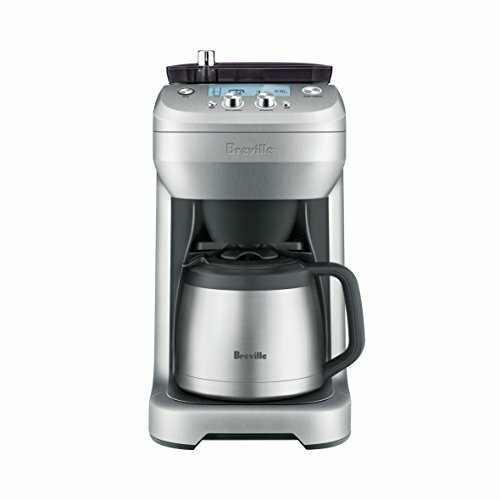 One of our top recommendations for espresso machines in general, this Breville is a great bean to cup machine. This sleek, semi-automatic machine is quite similar to the best selling Barista Touch except it focuses more on semi-automatic capabilities. The conical steel burr grinder is top of the line, and the build quality overall makes this machine makes is durable and reliable. Additionally, a big selling point for this machine is the level of customization you can achieve with a minimal learning curve. 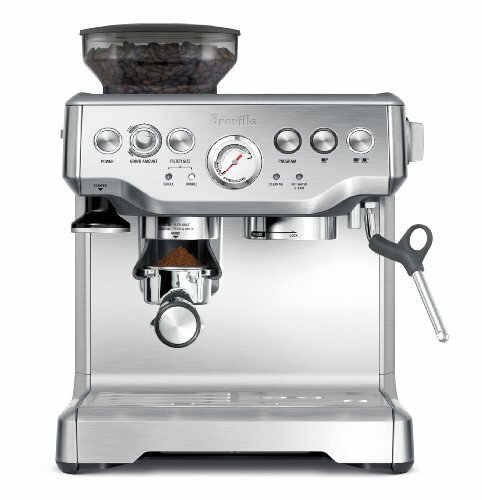 With this Breville, you can adjust temperature, grind fineness, dosage, and tamping. Between all of that, you can get a completely customizable cup. Some of the only draw backs of this machine are that it’s a little on the large side and it’s a tad noisy. Other than that, this is an excellent machine especially for the price point. 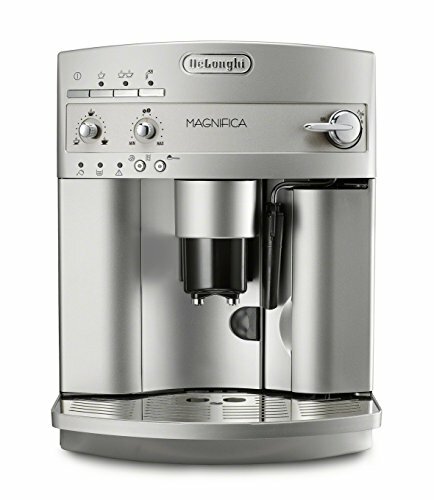 If you need something a little more streamlined, the Magnifica might be the machine for you. This super automatic espresso machine packs a considerable punch for a relatively compact footprint. It has an adjustable conical burr grinder and a cappuccino system with a milk frother. It’s decently customizable for a superautomatic machine. You can change the brew strength, make specialty drinks, and opt for short or long shot pulling. Additionally, this is a pretty low maintenance machine with removable parts and an auto descaling indicator. One of the only downsides to this machine is that it’s a little noisy except when it comes to letting you know it’s done brewing, so you will have to check in on it. 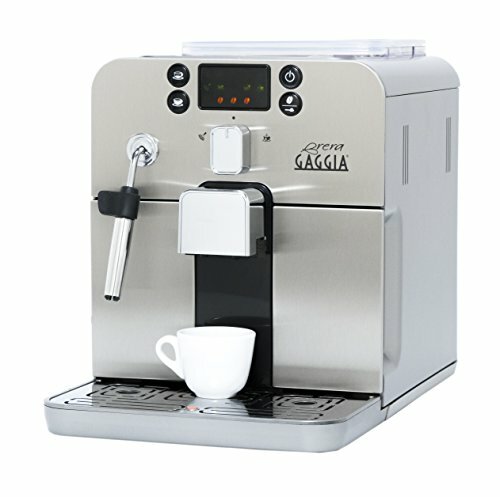 From one of the first ever espresso machine brands, this Gaggia bean-to-cup doesn’t disappoint. The price point for this machine is on the upper end as far as this list goes, but in the realm of espresso machines it’s actually closer to a mid-range price. The biggest difference between this machine and the other ones on the list is that it has a ceramic (not steel) burr grinder. So with proper maintenance, this grinder will perform well for far longer than a stainless steel one. It also automatically adjusts the rpm and grind time to best suit your blend. Overall this is a pretty simple, straightforward mid-range machine. The main reason we’ve included it is because it is a relatively affordable and reliable option if you’re looking for a ceramic burr grinder. We’ve covered how to select a good grinder pretty well in the past. But here is a quick recap in case you forgot (no judgement here). Keep in mind that all of the grinders in these machines are burr grinders which is the standard for high-quality built-ins. So this info is mostly for if you decide to branch out from the suggestions we’ve made here. Burr is the way to go here, hands down. Blade grinders tend to chop beans less regularly, which results in uneven or sub-par extraction. Burr grinders on the other hand guarantee all of your grounds will be the same fineness, optimizing the resulting flavor. Most built-in and electric grinders use steel blades for a couple of reasons. The main one is that ceramic doesn’t hold up well against sharp, sudden impacts. So if there are some foreign bits of not-coffee in your beans (which is pretty common), these can easily damage the grinder. In addition to being a bit more crack resistant, steel grinders actually begin sharper than ceramic ones. However, ceramic grinders maintain their sharpness for longer. Some coffee snobs argue that ceramic is better because there is no generated heat that might negatively impact extraction. But, there have been no conclusive studies that have shown this to be true. So your stainless steel grinder should do the job just fine. However, if you are into the bougie, high quality feel and longevity of ceramic, check out the Gaggia machine we have listed above. As you’ve probably noticed, we’ve split this list into drip coffee machines and espresso machines with grinders. That’s because while a fresh grind is important for both types of brewing, the styles are better for different types of coffee fiends. If you simply prefer an easy, delicious tasting cup of classic coffee, the drip brewers are going to be more up your alley. These typically require less maintenance and can usually brew larger batches of coffee in one go. Additionally, they are at a lower price point. However, as a general rule, drip brewers will have less customization options. So if you’re really looking to experiment with grind size, pressure, etc, they might not be the best choice for you. Also if you need a great tasting base for a specialty drink, most drip brewers can’t make a coffee concentrate strong enough to pass for espresso. On the other hand, espresso machines are going to be more expensive and require more maintenance. Plus they can have a bit of a learning curve. But, grind customization is pretty standard on these machines, as are things like steam wands or frothing systems. So if you’re looking to make cappuccinos or lattes, these are worth looking at. Regardless of what brewing team you play for, getting a machine with a built-in grinder can be a great way to up your coffee game. Remember to look for machines with burr grinders and be aware of what kind of drinks you plan on making, your budget, and customization needs before you buy.